FIRST LEGO League Jr. is designed to introduce STEM concepts to youth ages 6 to 9 through a building toy they know and love − LEGO®. For more information, or to start a team, contact the area FIRST LEGO League Jr. partners show below. FIRST LEGO League Jr. is managed by Partners in Central, Northwest and Northeast Florida, and informally by volunteers statewide. Focused on building an interest in science and engineering in children ages 6-9, FIRST® LEGO® League Jr. is a hands-on program designed to capture young children’s inherent curiosity and direct it toward discovering the possibilities of improving the world around them. FIRSTs newest program, FLL Jr. came to Florida about four years ago and now boasts over 100 teams. Just like FIRST® LEGO® League (FLL®), this program features a real-world challenge, to be solved by research, critical thinking and imagination. Guided by adult coaches and the FLL Jr. Core Values, students work with LEGO elements and moving parts to build ideas and concepts and present them for review. The FIRST LEGO League Jr. Challenge , for youth in kindergarten through 4th grade, has a different theme each year, usually tied to the FIRST LEGO League Challenge. The 2017 challenge is called Aqua Adventure! Each challenge has two defined parts: the Show-Me Poster and the Model. The Show-Me Poster requires teams to illustrate their research and team journey. It provides an opportunity for them to share what they studied, what they learned, and to show information about the team and each team member. The Model gets teams moving! Teams build a representation of what they are researching, based off the Challenge, and incorporate simple machines and movement into their creation. 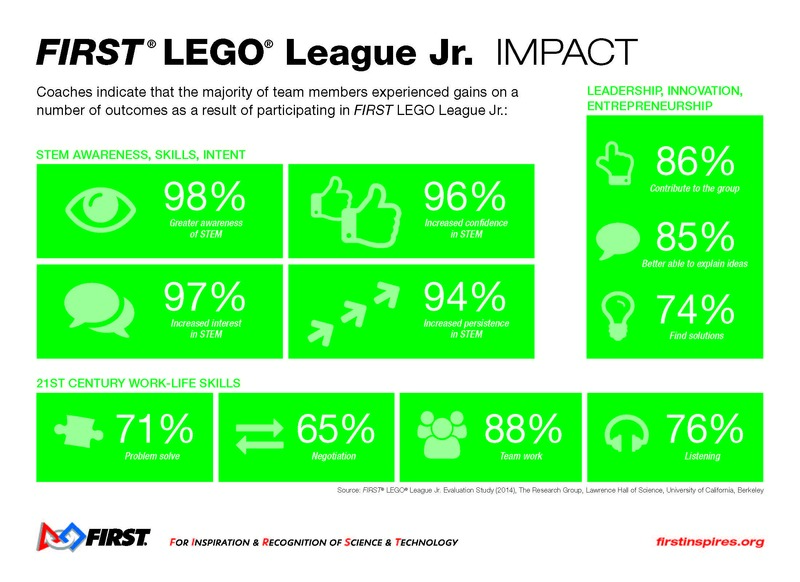 Visit the FIRST LEGO League Jr. page at FIRSTInspires.org or connect with the local contacts listed above.